A wood water car in the Hambone yards. Heritage Junction Museum of McCloud, Inc.
Water is a necessity in the woods, required to keep thirsty men, animals, and steam equipment hydrated. Water is also useful in many other chores, such as fire fighting and dust control. 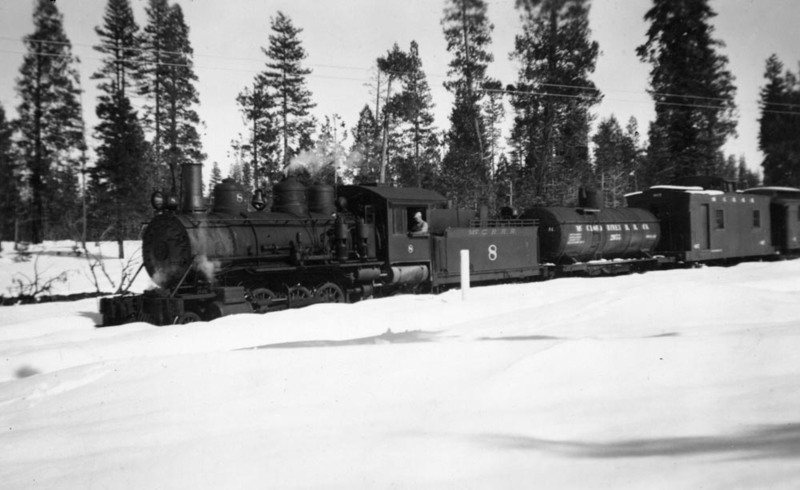 The railroad maintained an extensive roster of water cars throughout most of its history. Most of these cars consisted of wood tanks on standard flatcar frames, with some steel cars used late in the steam era. 83- Water car, wood tank. Temporarily converted circa 1899 from log flat #83. 571- Water car, wood tank. Converted 2/28/1931 from log car #571. Destroyed 7/13/1931 by fire. 1719, 1721- Converted prior to 1948 from material flats of the same number. 2,700 gallon capacity. Both cars retired 12/31/1953. 1801- Water car, wood tank. Built before 1906. Retired 4/2/1932. Water cars in 1800-series generally had 26-foot rectangular wood tanks, approx. capacity 4,000 gallons. Water car #1801 on left, along with a large number of other cars retired around the same time, are just about to be burned at the upper end of the McCloud yard. From the T.E. "Eddy" Glover collection. 1803:1- Water car, wood tank. Built before 1906. Retired 6/1917. 1803:2- Water car, wood tank. Converted 5/1923 from log flat #49. Retired 4/2/1932. 1805- Water car, wood tank. Built before 1906. Retired 7/28/1930. 1807- Water car, wood tank. Built before 1906. Retired 4/2/1932. 1809- Water car, wood tank. Built before 1906. Retired 4/2/1932. 1811- Water car, wood tank. Built before 1906. Retired 4/2/1932. 1813:1- Water car, wood tank. Built before 1906. Converted 4/1914 to Horse Car #1769. 1813:2- Water car, wood tank. Converted 5/1923 from log car #137. Retired 6/1937. 1815- Water car, wood tank. Built before 1906. Converted 6/30/1914 to tool car #1771. 1815:2- Water car, wood tank. Converted 5/1923 from log flat #217. Retired 9/1934. 1817:1- Water car, wood tank. Built before 1906. Conv. 1927 to gasoline car #1817. 1819- Water car, wood tank. Built before 1906. Retired 8/1919. Restored 4/1920. Retired 2/28/1930. 1821:1- Water car, wood tank. Built prior to 1906. Retired 5/15/1914 and rebuilt to 1821:2. 1821:2- Water car, wood tank. Rebuilt from 1821:1. Retired 12/1922. 1821:3- Water car, wood tank. Converted 5/1923 from log flat #323. Retired 10/1938. 1823- Water car, wood tank. Converted prior to 1907 from log flat 215. Retired 4/2/1932. 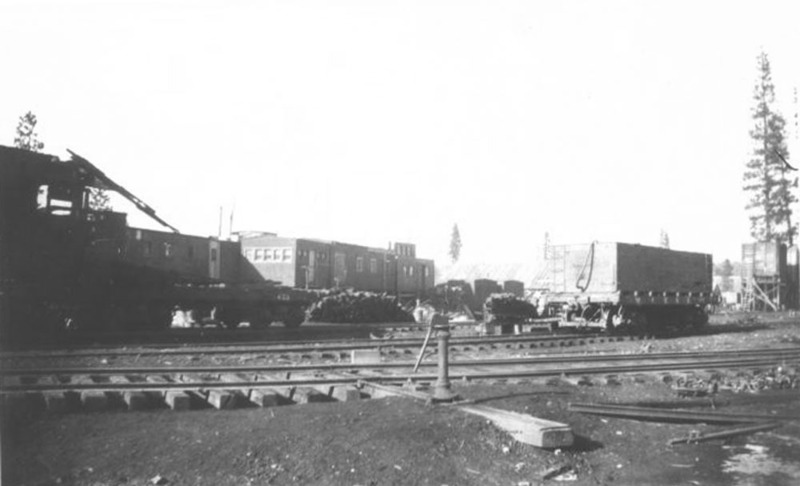 Some of the group of water cars and other equipment retired on 4/2/1932 preparing to be burned at the upper end of the McCloud yard. From the T.E. "Eddy" Glover collection. 1825:1- Water car, wood tank. Built before 1907. Retired 5/12/1912. 1825:2- Water car, wood tank. Converted 5/1923 from log flat #251. Retired 2/25/1931. 1827- Water car, wood tank. Built before 1907. Retired 4/2/1932. 1829:1- Water car, wood tank. Built before 1907. Converted 4/1928 to gasoline car #1829. 1833- Water car, 26-foot steel tank. Built 5/1909. Retired 11/1926. 1835- Water car, 26-foot steel tank. Built 5/1909. Retired 9/1934. 1837- Water car, wood tank. Built 7/1909. Retired 4/2/1932. 1839- Water car, wood tank. Built 7/1909. Retired 10/1/1928. 1841- Water car, wood tank. Built 4/1910. Retired 5/1925. 1843- Water car, wood tank. Built 4/1910. Retired 4/2/1932. 1845- Water car, wood tank. Built 4/1910. Retired 11/1926. 1847- Water car, wood tank. Built 4/1910. Retired 4/2/1932. 1849- Water car, wood tank. Built 4/1910. Retired 4/2/1932. 1851- Water car, wood tank. Built 4/1910. Retired 4/2/1932. 1853- Water car, wood tank. Built 3/1911. Retired 1/1927. 1855- Water car, wood tank. Built 5/1911. Retired 4/2/1932. 1857- Water car, wood tank. Converted 7/1917 from log flat #53. Retired 4/2/1932. 1859- Water car, wood tank. Converted 7/1917 from log flat #119. Retired 4/1932. 1861- Water car, wood tank. Converted 8/1917 from log flat #29. Retired 4/1932. 1863- Water car, wood tank. Converted 8/1920 from log flat #111. Retired 4/1932. 1865-Water car, wood tank. Converted 8/1920 from log flat #153. Retired 4/1932. 1867-Water car, wood tank. Converted 8/1920 from log flat #257. Retired 4/1932. 1869-Water car, wood tank. Converted 8/1920 from log flat #277. Retired 4/1932. 1871-Water car, wood tank. Converted 7/1922 from log flat #235. Retired 9/1934. 1873-Water car, wood tank. Converted 7/1922 from log flat #135. Retired 4/1932. Retired water cars and other equipment being burned at the upper end of the McCloud yard. From the T.E. "Eddy" Glover collection. 1875-Water car, wood tank. Converted 7/1922 from log flat #351. Retired 9/1934. 1877-Water car, wood tank. Converted 5/1923 from log flat #355. Retired 6/1937. 1879-Water car, wood tank. Converted 5/1923 from log flat #171. Retired 9/1934. 1881-Water car, wood tank. Converted 5/1923 from log flat #37. Retired 9/1934. 1883-Water car, wood tank. Converted 5/1923 from log flat #107. Retired 4/5/1934. 1885- Water car, wood tank. Converted 5/1923 from log flat #165. Retired 9/1934. 1887- Water car, wood tank. Converted 5/1923 from log flat #61. Retired 4/24/1934. 1889- Water car, wood tank. Converted 5/1923 from log flat #263. Retired 9/1934. 1891- Water car, wood tank. Converted 5/1923 from log flat #203. Retired 6/1937. 1893- Water car, wood tank. Converted 5/1923 from log flat #207. Retired 5/14/1936. 1895- Water car, wood tank. Converted 5/1923 from log flat #205. Retired 4/1932. 1897- Water car, wood tank. Converted 5/1923 from log flat #325. Retire 10/1938. 1899- Water car, wood tank. Converted 5/1923 from log flat #189. Retired 9/1934. 2000, 2001- Water cars, converted from oil tank car #2000 and #2001. 2051, 2053, 2055- Water cars, 6,500 gallon capacity. Originally built 1902, 1904, and 1903 respectively. Purchased 10/1934 from United Commercial, f.o.b. Winehaven, California. #2051 received power brake on 4/12/1957 and retired circa 1972; #2053 dismantled and sold to Cownings Mill circa 1965; and #2055 once mated to Crane #8 and retired circa 1972. Water car #2055 as part of a work train about 1938. Jeff Moore collection. 2057- Water car, 6,500 gallon. Converted 7/1935 from oil car #1707:2. Retired circa 1965. 2059- Water car, 6,500 gallon. Converted 10/1936 from oil tank #2006. Dismantled 1963 in Burney, with tank leased to Morrison-Knudson for use in Pit 6 and 7 dam construction projects. 2061- Water car, 3,700 gallon. Converted 3/1940 from log flat #2245. Retired 1950, with flat converted back to m-o-w use under its original number.